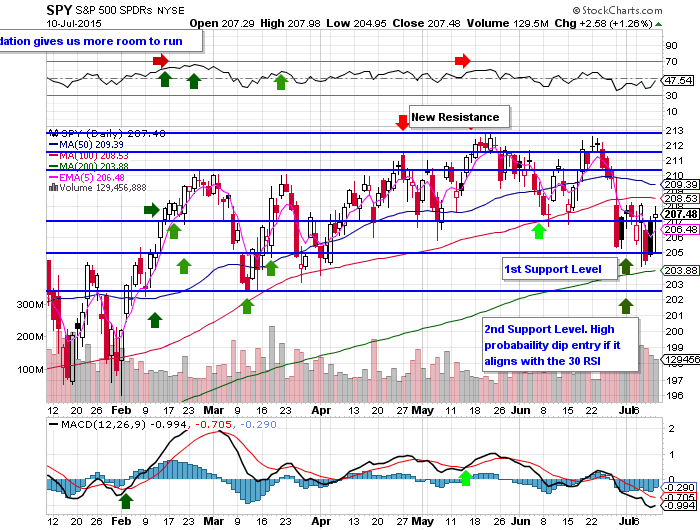 $SPY is currently in an 8 day trading range, with $208 as resistance, and $204 as support. $SPY ran up against this resistance again on Friday. For a momentum breakout, $SPY must breakout and close over the 100 day SMA. Prices will likely be stuck in this range until the uncertainty over Greece subsides. $SPY has closed below the 100 day SMA for 9 consecutive trading days. This is the next resistance level after $208. The 47 RSI is showing weakness, but is basically neutral. The MACD is still indicating a downtrend and not even close to crossing over bullish. This market is still being traded and not accumulated. The market is range bound, with no trend in either direction, as $SPY is only up +0.94% for the year. A close under the 200 day will be the first signal of a change in market dynamics and the beginning of a potential downtrend. I would begin trading the short side under the 200 day. I will be a dip buyer at a fall to the 200 day SMA or the 30 RSI with size. If they align on a pullback, this is one of the best risk/reward signals for going long in the $SPY. I explain how I trade price action here with my Moving Average 101 Trading eCourse.